Camping with dinosaurs! Dinofanatics of all ages will love this book! Cute dinosaurs Story about a girl with a tiny head or super big hat going camping. This was a bit distracting from other cute dinosaur illustrations. Fun and quick story for kids about 3-5 years old. We are very often silly at home or even out and about. We roll down non-existent hills in the park and sing silly songs while walking around town. As a parent, my dignity takes a back seat when it comes to having safe fun with my child. My husband has just peeked over my shoulder and would like to remind me that I was this way before Bug. Oh well. In any event, I like silly books that can laugh at themselves and make us, in turn laugh. Camp Rex does this with such wonderful finesse and grace.The book is laid out as a guide to camping and hiking in the great outdoors but it’s soon evident that even though all the characters (dinosaurs included) are wearing scout uniforms, they don’t know anything about camping. They’re respectful but constantly at odds with the nature surrounding them. In the end, they return to they’re backyard enjoying the most honored of camping traditions from the comfort of their own home, roasting marshmallows.Molly Idle’s delightful illustrations don’t give us much of a background story. Why are this lady and her son marching around with a Tyrannosaurus Rex, Stegosaurus, Triceratops, and Pterodactyl in tow? It doesn’t matter. It’s a silly story, embracing its silliness. The dinosaurs cleverly go about pitching tents and roasting marshmallows in such a ridiculous way, that even Bug was laughing and he’s never even been camping.It was cute, entertaining for all the parties reading it, and endearing. We’ll definitely be checking out more Molly Idle books in the future. This embodies many qualities of a good picture book, the most important being how the illustrations interpret the story (in my opinion). This text could have been illustrated in a number of ways (see marshmallow comment below), with a number of different characters in a number of different styles. This one apparently builds off the previously published "Tea Rex" (which I've not yet read), so I can't comment on that. I like the 'guide to camping' path of the story and how it ends "...in their own backyard. "Illustrations have an outdoorsy green hue, and fill the page with the girl & boy's dinosaur friends. I can't tell if the girl is a girl because in some pictures she looks more like an old lady - almost an elderly Juliet Low, and in one she resembles an evil Disney character. My favorite illustration is when the Rex uses the tree trunk with it's many branches each holding a marshmallow over the campfire!This would be a great one to read aloud without showing the pictures, and having students interpret it to come up with their own illustrations. What could be more fun than camping with friends? A girl and her younger brother set out to camp with their dinosaur friends. They hike, set up tents at the campsite, and explore the area (avoiding dangerous plants and wildlife, of course). Canoeing is fun until they all end up in the water. Building a fire takes teamwork, but it pays off when they roast marshmallows and sing under the stars. Ghost stories and strange nighttime sounds keep everyone from falling asleep too quickly, but in the morning they have pancakes, pack up, and hike back home. It has been a wonderful adventure!The storytelling is expertly done through gorgeous illustrations. The text reads like a how-to manual for camping. The little brother just cracks me up! All the characters are so expressive and the situations they get themselves into are funny. Great book for your little wilderness explorer! When going camping, one must be prepared to experience the out-of-doors responsibly and enjoyably, including those would-be campers who are of the dinosaur variety.This follow-up to Tea Rex doesn't work quite as well as its predecessor, but it still has the same charm and fun and wonderful illustrations. Cordelia and her little brother have so much appeal it's crazy and the dinosaurs have tons of personality and just look and feel like giant plush toys. The kids (3/1.5) have been loving both of these books. Another Molly Idle children's book, and another book I love! It might be safe to say that Molly Idle is my favorite Children's book author/illustrator at the moment. Her background working for Disney Pixar really shows in her illustrations that are so animated and detailed. Camp Rex is a fun book about camping with your friends, in this book the friends happen to be dinosaurs! Different from her Flora series, this picture book has words. The story is simple but fun to read. Great for beginning readers and even upper elementary students to show them how illustrations help to tell a story and make it come alive. The gem of Idle's Rex books are the illustrations. So much in there--particularly in small details, it would be impossible to share all of it in a storytime setting. But a lap-read and read-alone or perfect. And this one was fabulous. SO, SO much--even more than in Tea Rex. Something on every page. I found myself going back through some pages to see what I missed, or to connect various storylines that were being continued yet I had missed an element somewhere. So much fun. Perhaps I'll at least put it out on display in a dino theme. It seems to be a common theme lately that I choose books for the kids' bedtime story that are not entertaining. While this book had great pictures, I was hoping for a book about dinosaurs going camping - not simply a book about camping in general with dinosaurs in the drawings. Honestly, it could have been titled simply, Camping, and had pictures of only children and I don't think the story would have changed at all. My boys laughed at a couple pictures, though, so I guess bedtime story hour wasn't a total failure. I love how the text and the pictures show two different versions of camping. The words read almost as a how-to manual for camping, and expound of the vast delights of communing with nature. The pictures, however, show that camping, especially if your companions are dinosaurs, might not live up to all the hype. As a non-camper, I got a lot of chuckles out of this one! Make sure to start inside the front cover and compare it to the illustration on the back cover. Molly Idle has used all of the book to tell her story. T-Rex and his friends go camping, which proves to be a challenge for the little girl who has to remind T-Rex about all the safety rules of outdoor life. Still they manage to have lots of fun.Endearing illustrations, subtle educational value, and of course fun make this one a winner. A great pick for anyone preparing for an outdoorsy adventure as the safety rules reviewed are good ones but this covers them in a totally fun way. Playful interaction between text and illustrations will make this a crowd pleaser. A little girl takes her little brother and assorted dinosaurs on a camp out. She being the "experience camper" tries to keep the others out of trouble with the help of her Wilderness Guidebook, but it's not easy. Kids will have fun (I know I did) seeing what the teddy bear and the dinosaurs are up to in each illustration. Cute follow-up to Idle's book Tea Rex. I enjoyed the first book more, but Camp Rex still delights with clever moments in the illustrations, such as the t-rex gathering firewood by pretty much uprooting a whole tree, and then roasting marshmallows on all the branches. Or the triceratops roasting marshmallows on his horns. The illustrations!!! I could just lose myself in the illustrations! When I read this, I hear the narrator in my head, in the tone of a 50s/60s teaching film. Love this even more than the first book, which I didn't think was even possible. The kids loved this book, especially the scenes with the marshmallows roasting over the fire. They kept pointing out fun details in the illustrations and laughing.This book is great for fans of Molly Idle's other "Rex" books (Tea Rex, Sea Rex, etc...), for dinosaur fans, for camping fans & marshmallow fans. This book goes through the basics of camping sort of like a how-to guide with the words. The illustrations are a bit more on the humorous side. How could that not happen when dinosaurs are camping with humans after all? This could work for smaller storytimes, but I'm afraid the intricacies of the illustrations won't be seen in a larger crowd. I love this series. Nothing will beat "Tea Rex", but this one is still super cute. The illustrations are a bit hard to make out at times. I feel like they could be more defined. But the story is cute and easy. I usually love Molly Idle and I thought Tea Rex as fantastic. This one, not so much. A great storytime book about camping and dinosaurs. I love Molly Idle's illustrations. They are so charming. Camp Rex is a humorous story of dinosaurs who follow a little girl in a huge hat along a trail to have a camping experience. The reader will follow this unique group along a trail, learn how to pitch a tent, discover the local flora and fauna, go down a quiet river in a canoe, and learn to build a fire. Well at least they try! I think the young readers could actually learn quite a bit about what a camping experience should be like and at the same time discuss what mistakes were being made by looking at the illustrations. This book is quite the tongue-in-cheek story. The illustrations are large, soft, colorful pencil drawings. They are very humorous and tell the real story if the reader looks carefully. For example they are warned about the poison ivy and about various safety practices. As in other books by this author, the text is very limited, but oh the wisdom that is illustrated in the drawings. Young children will be giggling over the funny situations the dinosaurs find themselves in. Camp Rex is a great book for young children. I would have it in every public library picture book section and elementary school library. What a great way to introduce camping to children who may not have had this experience. 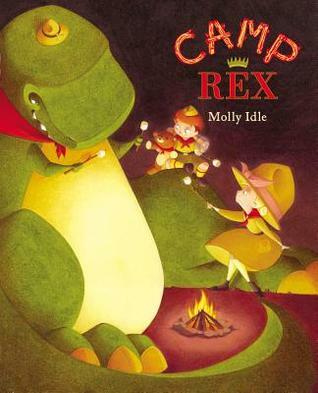 All the characters from her previous Tea Rex are back in this picture book, which follows a girl and her brother and their dinosaur friends on a camping trip. Of course, there are proper rules to follow to insure that everyone has fun on the trip while also respecting Mother Nature. There are plenty of mishaps, of course, with tipped over canoes and a mistake with a beehive that looks a lot like a pine cone to a T-Rex. The facial expressions of the youngsters and the animals are priceless as are the scenes of them listening to spooky stories and toasting marshmallows. I laughed out loud at T-Rex's use of the roots of an uprooted tree to maximize his number of the gooey treat at the fire, and I also loved the group's return home to civilization where they camped out in safety while T-Rex reads a very tiny (to him, at least) book. There's some endearing and worth noting about every page and every illustration. I continue to enjoy the images fashioned by this author who works with Prismacolor pencils on vellum finish Bristol paper to create her trademark images. While I've read plenty of books in which dinosaurs follow human pursuits, this one appealed to me the most out of all those. Surely, it's the sweetness of that big old T-Rex that has me intrigued. This story reminded me a lot of cartoons from the '60s and '70s wherein there is a narrator whose words tend not to accurately depict the action in the pictures, which makes the story very funny. The palette is made up of fairly neutral colors, which fits with the outdoor/camping theme. The added humor comes from the fact that there are dinosaurs in the pictures but there is no mention of them in any of the text. Good for ECE and young elementary readers! Molly Idle - Molly Idle has been drawing ever since she could wield a pencil. But while she started scribbling before she could walk, her professional career as an artist began slightly later…It was upon her graduation from Arizona State University, with a BFA in Drawing, that Molly accepted an offer to work for DreamWorks Feature Animation Studios. After five years, a number of film credits, and an incredibly good time, she left the studio and leapt with gusto into the world of children's book illustration!Molly now lives in Arizona with her brilliant husband, two wonderfully mischievous sons, and two snugly cats. When not making mischief with her boys or watching old Technicolor musicals, she can be found at her desk scribbling away, with a pencil in one hand and a cup of espresso in the other- creating a plethora of profoundly whimsical picture books!